We are licensed to sell alcoholic beverages with snacks and meals only. 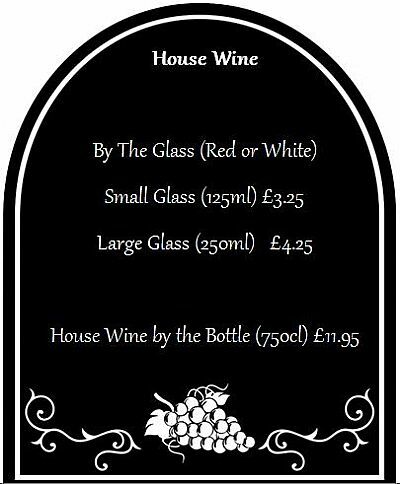 Please see chalkboard in the Tea Shoppe for our selection of wine and beer. PLEASE NOTE: All items are subject to availability and freshly prepared to order, so please be patient. Please tell a member of staff when placing your order if you have any dietary requirements the Chef should be aware of. Bookings must be made 48 hours in advance and any dietary requirements mentioned at time of booking. Available from noon Tuesday – Sunday. Selection of sandwiches: smoked salmon with cream cheese & rocket, egg cress and black pepper, coronation chicken and Chef’s seasonal choice. Mini plain scone with preserve & clotted cream and a selection of four different cakes with a seasonal touch. Choose a pot of tea or Americano (free refills). an extra £3.25 per person. Selection of sliders: curried egg, pastrami & gherkin with Dijon mustard, chicken and parmesan with mozzarella. Vanilla milkshake. Four different American themed cakes (one contains nuts). Choose a pot of tea or Americano (free refills).